Two pages from The Beatles book signed by John Lennon, Paul McCartney, George Harrison and Ringo Starr go under the hammer at Moore Allen & Innocent on April 6 with an estimate of £1000-1500. The signatures of John Lennon, Paul McCartney, George Harrison and Ringo Starr all appear on a double-page photograph in a copy of The Beatles Book. It is included at Moore Allen & Innocent’s auction on April 6. Despite being in poor condition, the signatures are estimated at £1000-1500. 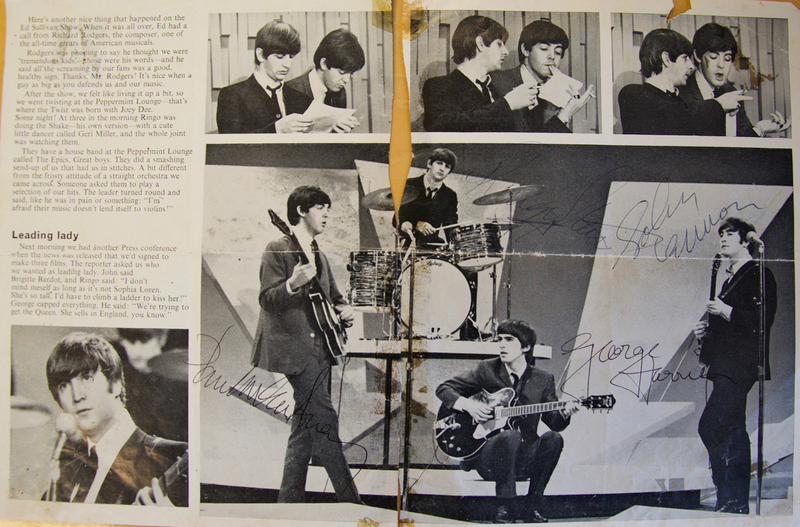 The pages were unevenly cut from the magazine and are scarred with sticky-tape marks, but a full set of signatures from the Fab Four are increasingly difficult to come by. This is the first full set offered by the auction house since 2013, when an autograph book sold for £3800. The magazine was given to the vendor in the mid-1980s as a 21st birthday present. It was his aunt who had originally obtained the signatures around 20 years earlier.